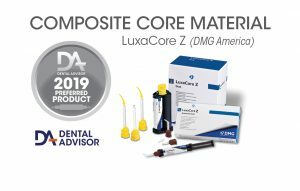 LuxaCore Z is a radiopaque, dual-cured composite core material used for build-ups and post cementations. With the addition of zirconium oxide and nanofillers, the compressive strength and physical properties of LuxaCore Z have been enhanced compared to the original LuxaCore material. LuxaCore Z is offered in two delivery systems: the small SmartMix dual-barrel syringe and the larger auto-mix cartridge. It is available in three shades: A3, Blue, and Light-Opaque. Working time is 1:30 minutes, chemical curing time is 5:00 minutes, and light-curing depth is 2 mm at 20 seconds and 4 mm at 40 seconds. The SmartMix syringe kit contains two, 9-g syringes; 10 SmartMix tips; and 10 intraoral tips. The auto-mix cartridge kit contains one, 50-g cartridge; 35 auto-mix tips; and intraoral tips. The manufacturer recommends using a dual-cured adhesive such as LuxaBond-Total Etch bonding system. Thirty-two consultants evaluated LuxaCore Z in 450 clinical cases. This product received a 98% clinical rating. LuxaCore Z was well received by consultants. The ease of dispensing and trimming the material were the most frequently cited positive features. The narrow, curved intraoral tips ensure precise, direct application of the material, while minimizing voids. LuxaCore Z flows and adapts well to preparations and posts. Clinicians who prefer a condensable core material did not rate the stackability of LuxaCore Z well because packability of this material is minimal, limiting instrument manipulation. Working and setting times provide adequate time for application and the ability to light-cure for rapid set. 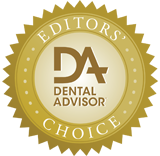 The A3 shade provides a natural dentin color suitable for use under all-ceramic restorations. 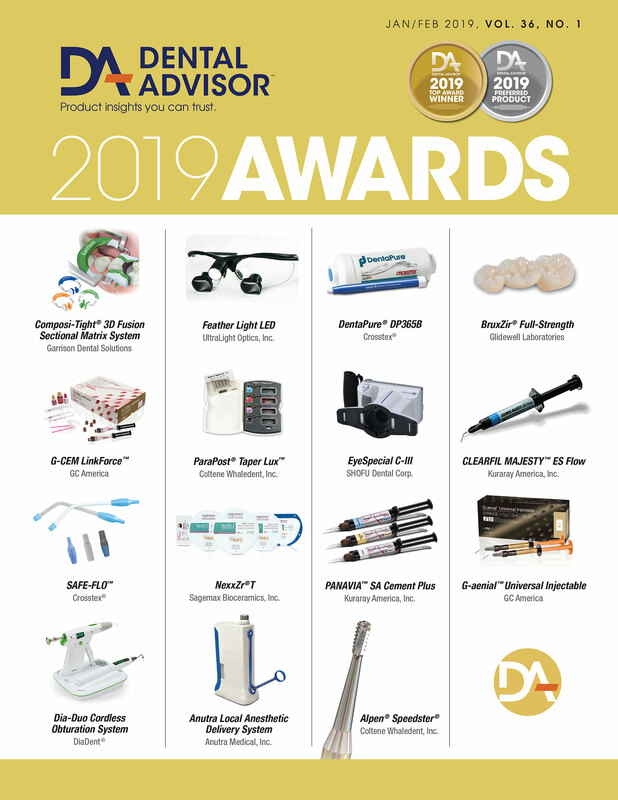 Eighty-eight percent of consultants rated LuxaCore Z equal to or better than their current core material, and 78% of consultants would recommend LuxaCore Z to a colleague. The use of one-bottle, self-etching (7th-generation) bonding system is contraindicated; read the instructions for use carefully. Use of LuxaBond-Total Etch shortens the working time of LuxaCore Z in the root canal to 30 seconds due to the contact with the Pre-bond. Cure in layers for larger core build-ups because of low viscosity.